Jim Corsi, creator of the "Corsi" Statistic. Photo by Toronto Star. Corsi. Fenwick. Score Effects. Quality of Competition. Hockey analytics, in summary, are a contentious topic between the writers who use them as the basis of player comparisons and an "old timer media" that screams "watch the game with your eyes!" in between elderly outbursts of "Get off my lawn!" Casual fans of hockey are turned off by cryptic analytic terms because the nomenclature is not self-referential, IE, the word "Corsi" reveals nothing about what the statistic tracks whereas "Shots on Goal" is self-evident. Add to that confusion the fact that no television broadcast, be it local or national, even bring ups the advanced terminology, and hockey analytics turn into a topic that glazes the eyes and/or causes people to change the channel (or page). "Corsi" refers to the number of attempted shots (includes shots that are not on net and shots that are blocked or deflected) a player and/or his linemates generate during even strength play, with that total (usually) compared against the opposing line to yield a percentage of shots for/against. Corsi was deemed significant by statisticians because teams with a high overall Corsi FOR rating had a statistically relevant correlation with winning hockey games. Correspondingly, elite players had their Corsi figures broken down and compared against other skaters, and once again, there was a correlation between high Corsi FOR and scoring and thus winning. The problem with Corsi is that not every shot attempt is created equal, and that teams that willingly allow long shots on goal from the perimeter of the ice (low percentage scoring chances) are not necessarily being outplayed, as surrendering a large number of harmless shots is not irrefutable evidence of poor play. Analysts recognized these limitations, and attempted to further quantify Corsi numbers by further breaking down Corsi into where play started (offensive or defensive zone faceoffs), quality of opponents on the ice, and the score of the game when certain shots on goal happened. 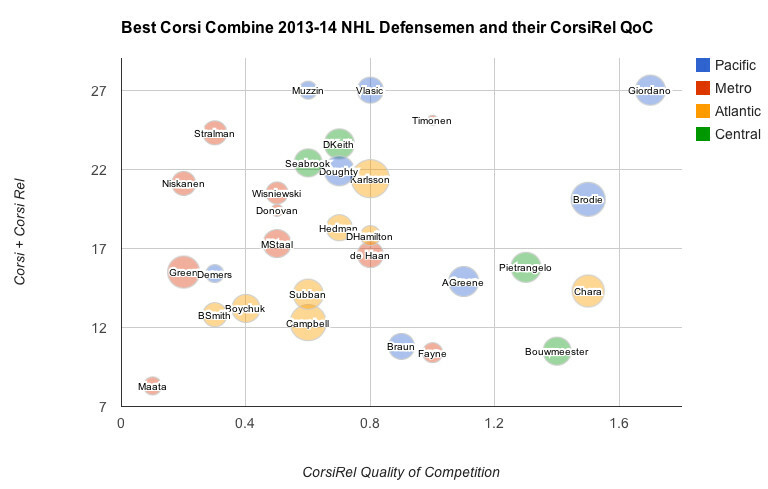 Sample Corsi vs Quality of Competition Chart. The latter point, score effects, is important because teams with a solid lead (usually defined as 2 or 3 goals based on the amount of time remaining in the contest) typically surrender more shots on goal while simultaneously decreasing the quality of scoring attempt by collapsing in their own defensive end in front of their goalie. 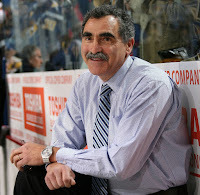 Even with these situational improvements, Corsi fails to recognize deflections, shots taken during off-strides, the speed of the shot, the type of shot, whether or not the shot was taken with a screen, if the shooter was able to change the angle of his shot prior to release, whether the puck was knuckling or had a straight trajectory, if a defensive breakdown led to the shot attempt, and much, much more. In the coming days, I will explore more hockey terms and list their limitations before presenting my own case for subjective analytics in hockey. Any reader with an idea about a type of play that should be considered during a subjective watching of a game should feel free to comment below or tweet me at @DXTraeger.